Short in stature but big in heart, the loyal Welsh Corgi is the smallest in its class of hard-working herding dogs. Although relatively popular, the Corgi has a long and storied history, full of intrigue and of course, pure athleticism. I have always loved good historical “tails,” especially if they involve dogs, and the Corgi does not disappoint, as you will soon see. #1 With two types and many colors, you can choose! #2 Is the Corgi a fairy dog-mother? #3 If you adopt this royal canine, you become royal. #4 Want the longevity of a small dog but the heart of a big dog? #5 The Corgi will herd you to the park. #6 Intelligence and athleticism meet in the Corgi. #7 They might shed, but their coats are water-resistant! There are technically two different breeds of Corgis–Pembroke Welsh and Cardigan Welsh–each named after a county in Wales, where they originated. But the breeds are so similar that they weren’t classified separately until the American Kennel Club (AKC) decided to get particular in the 1930s. 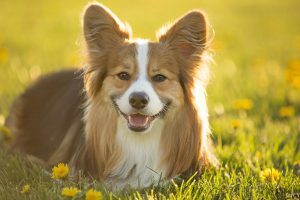 Although the Pembroke Welsh Corgi is the more popular and younger of the two breeds, it is by no means a “young,” as it was first bred in the 12th Century. It has a shorter and sleeker (read: lighter-boned) body than its Cardigan brother, but these differences are subtle because the two breeds were crossbred in the 19th Century. The sturdy Cardigan Welsh Corgi has more color varieties. The AKC considers it a Vulnerable Native Breed because its numbers have been declining. But here the differences end. Both breeds of Corgis are stocky but extremely athletic, often running faster and jumping higher than you might expect from stature alone. Interestingly, in Wales, Corgi means “dwarf dog,” but the Welsh people respected these dogs’ ability to do tricks and herd-like nobody’s business. It is said that Flemish Weavers brought the direct ancestors of the Pembroke Welsh across the channel in the 10th Century. When they arrived, they saw the native Cardigan Welsh for the first time and observed the Corgi be an integral part of the Welsh family unit. The Corgis herded and provided evening entertainment. Perhaps it was during one of those evenings of entertainment that this fairy-tale was created. The Welsh people believed that woodland fairies bestowed the amicable Corgi on the Welsh people as a gift. Of course, the Corgi’s white markings, which can only be seen by those who understand and truly see, are markings from fairy saddles. No doubt someone created this fairy-tale with children in mind. After all, the Corgi was a family dog, beloved by all, especially by the children. 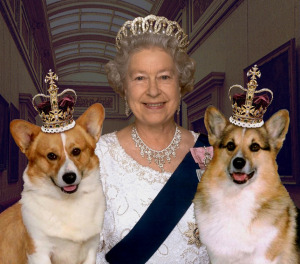 If you want to be escorted around like Queen Elizabeth II during the 2012 Olympic Opening Ceremony, then you need either a Corgi, James Bond, or both. I’d choose a Corgi. James Bond is stealthy, but who knows what shenanigans a Corgi can pull with a low center of gravity and an intelligent smile. Queen Elizabeth II first fell in love with Corgis as a child in 1933 and never looked back, owning over thirty Corgis throughout her life. She even took a picture with her royal dogs. When you adopt a Corgi, you get all the advantages of a big dog wrapped up in a small(ish) apartment-appropriate package. The Corgi stands ten inches to one foot tall and weighs up to thirty pounds. He will live, on average, twelve years, much longer than the average longevity of a large breed. Corgis tend to eventually die of canine cancer at old age but can be healthy for many years prior. But the Corgi is not your typical small dog. Like a larger breed, Corgis are good watchdogs and guard dogs. Their loyalty compels them to protect their people. Unlike a small dog, Corgis have a gruff bark. When not fending off an intruder, they are relaxed and friendly. With a Corgi, you can have the benefits of a big dog in a much smaller size! Corgis like to exercise, and in fact, they need this for their overall wellbeing. They tend to gain weight if they do not get enough exercise. And a small dog that appears to be slightly overweight may be obese. If you allow Corgis the time and space to exercise as they naturally desire, they should not have a problem with obesity. You know the generalization that jocks can’t be nerds and vice versa? Well, that doesn’t hold true when it comes to a Corgi. Corgis are extremely athletic, often participating in many dog sports. In their athleticism, you can see their close relationship to the Husky. But Corgis are also very smart and have acute senses. Luckily for their owners, they know when barking is necessary and when it isn’t! Corgis have one final quirk that might surprise you. They do shed quite a bit (twice a year), but their coats are water-resistant! So you can take your Corgi to the lake to swim, and he won’t get your car wet on the way home. The Corgi is a dynamic breed with all kinds of surprises. Regarding the shedding, as long as you brush their thick coats at least three times per week for ten minutes, you should be able to keep the shedding under control. With its water-resistant coat, low center of gravity, sturdy build, athletic prowess, loyalty and friendliness, a Corgi could even be a good companion for a child or novice dog owner. And its rich history will give you a story to tell on a doggie play-date. If you have a Corgi, please share your experience with this dog in the comments. I’d love to learn more about this loving companion.